The Sunset Inn North Shore Dr. Sunset Beach, North Carolina 28468 The Sunset Inn is located just across the Causeway at Sunset Beach, North Carolina. Situated along the marsh at Sunset Beach, the Sunset Inn is just minutes away from great shopping. The immediate area affords you over 16 challenging golf courses and excellent dining. Comfortable and roomy with a relaxed atmosphere, our spacious coastal home awaits your arrival. Experience the Sunset Inn. Whether you are looking for relaxing accommodations for your golf group, a family friendly villa for your vacation, or a gathering spot for your destination wedding, Sea Trail Resort has the ideal lodging for you. 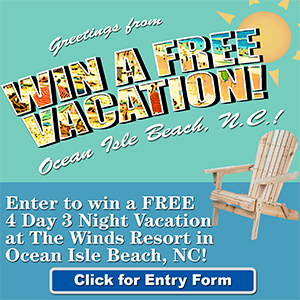 Ocean Isle Inn | Become a true islander and enjoy an oceanfront or sound view accommodation on the island of Ocean Isle Beach, North Carolina. Experience an incredible sunrise with your significant other. Oceanfront rooms and suites overlooking palm trees, lush tropical gardens, and our breathtaking island beach. Also Four, Five and Six Bedroom Resort Cottages with full kitchen, living room, and large whirlpool spa. Rent direct from individual owners and save! No reservation fees or add ons! Island beach and golf course condominiums. Tour our selection of beach cottages and condominiums in the beautiful, subtropical Brunswick Islands of NC.